Robert Henri was an American painter and educator, who founded the Realist group Ashcan School and organized the association of artists known as "The Eight," which famously challenged the restrictions of the National Academy of Design. Influenced by Impressionism and Realism, Henri investigated socially-relevant issues of early twentieth century society through compelling cityscapes and portraits. Glackens invigorated American painting, developed Impressionism, joined the Ashcan School, and focused on scenes of leisure rather than the slums that his peers preferred. George Luks was an American realist painter whose scenes of daily life are prime examples of the Ashcan School. Born in Pennsylvania to Central European immigrants, he originally worked in vaudeville before becoming a painter. While working as an illustrator he met William Glackens and the two worked together on developing the Ashcan style of art. George Bellows, although born in Columbus, Ohio, was an artist known for his realist depictions of daily life in New York. Bellows studied at the New York School of Art and became a member of the Ashcan School. He was one of the most famous and acclaimed American artists of his generation. Everett Shinn was an American realist artist known for scenes of daily life in New York and London. 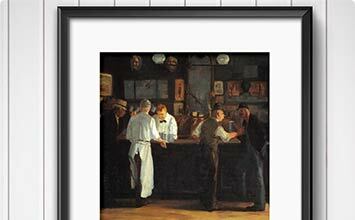 Part of the Ashcan School, he separated himself from his fellow members by primarily working in pastels. Shinn is said to be the model for the protagonist in Theodore Dreiser's novel, The Genius. John Sloan was a leader and founding member of The Eight and the Ashcan School of realist painting. Beginning in 1914, Sloan was also an influential art teacher at The Art Students League of New York.